Tara is 2 years old, and loves to chase a ball, and jump in the sea - as you can see from the photo! 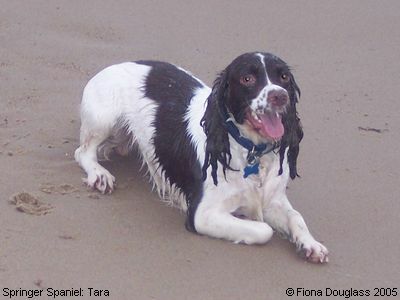 ‘Small is Beautiful’ - Fiona says she is the smallest springer she's ever come across, but she is very sweet, and has a pretty face, and fantastic temperament. Well we haven't seen much of this white stuff for a few years now! 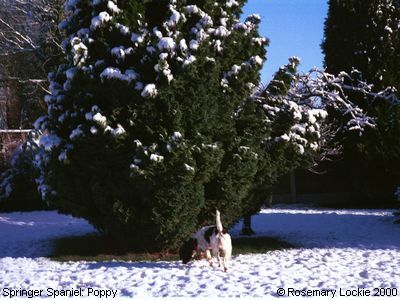 Poppy signals with her tail straight up in the air that she's found something of immense interest to sniff at! She was less than a year old when I took this photograph, and it was her first sight of snow. Young though she was, ‘that don't impress me much...’ was what she said... She's now (2005) age 6, and yet to see larger quantities!